Episode 1, Sands of Jakku. 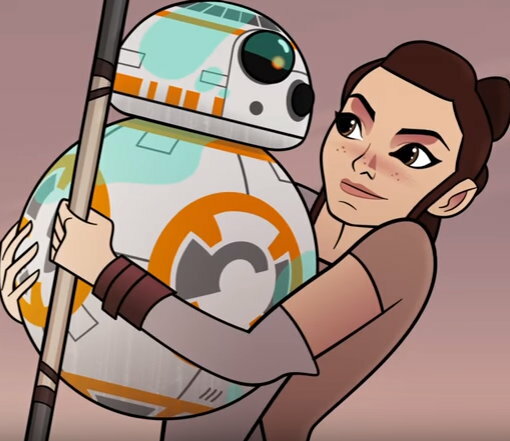 Disney recently began releasing episodes of its animated shorts series, Star Wars Forces of Destiny, which focuses each short story around one of the female heroes from the Star Wars Universe. At the time of writing four episodes were available on the Disney Youtube channel and they're okay. The stories are fairly simple and likely targeted at a younger audience in the 7-12 range. 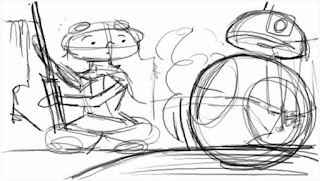 The animation style is fairly typical of modern, Saturday morning cartoons, with the characters being fairly faithful cartoon versions of their live action counterparts. The reason I'm making a cross face is because the first two episodes feature Rey protecting BB-8 from various nasties on Jakku. Specifically with BB-8 and Rey being chased through the desert before she finally puts a plan into action. You may wonder why I'm making a cross face about that? 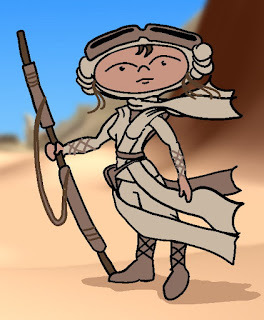 Well, over a year ago, I planned to make a Star Wars parody animation based around that very premise... different characters in pursuit of BB-8, on Jakku, with Rey stepping in to stop them. Where Disney's animated shorts are more straight forward adventure stories with a light sprinkling of humor, my animated short takes it's inspiration from the old Warner Brothers, Road Runner cartoons. Except the Road Runner element would be replaced by the double act of BB-8 and Rey, and would feature wacky solutions to thwart the characters in pursuit. I'm not going into too much more detail on my animated short because I still plan to make it but now Disney has released these two episodes, with a very similar concept, it's inevitable that someone is going to think I saw these before coming up with my idea. 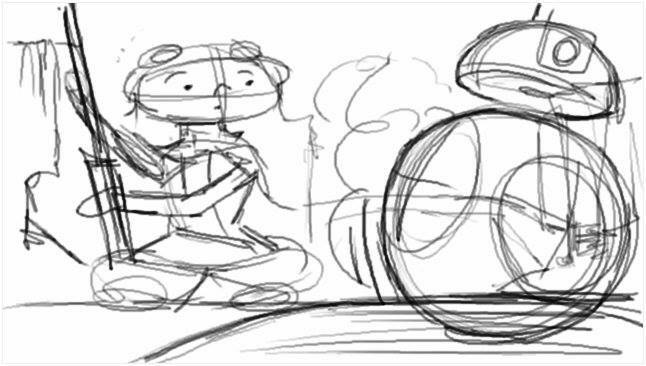 Storyboard panel from my planned animated short. I know my idea is not so especially unique that no one could have thought of it before however, I just want it on record that, should I get my short done, it isn't a knock off of the first two episodes of Forces of Destiny, and wasn't inspired by it in any way (anyone says otherwise and it'll be TET cross face for them! ).